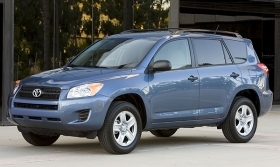 Through the end of November, Toyota has sold 132,346 RAV4s in the United States this year, up 3 percent from 128,225 in the same period last year. Toyota Motor Corp. is running overtime at all its North American plants to keep up with demand and replenish low stocks of vehicles. Toyota's latest boost in North American production comes at its plant in Woodstock, Ontario. Toyota, seizing on strong sales momentum for its small Toyota RAV4 crossover, said today that it will “immediately” begin hiring a second shift of 800 workers for the Woodstock plant. Toyota's robust production schedule represents a reversal of its situation in the first quarter of this year, when it was curtailing production days, reducing headcount and thinning out backed-up inventories along with the rest of the U.S. industry. The start of a second shift at Woodstock was delayed last year as economic problems mounted, and it is more than a year behind schedule, Tanguay said. Toyota opened a Web portal this morning to begin rapidly recruiting and training workers to get Woodstock up to full annual production of 150,000 vehicles in time for its new fiscal year, which starts on April 1. Toyota's plants in Woodstock and Cambridge, Ontario, have been operating on overtime at nine hours a day and some Saturdays. Even Toyota's production lines at New United Motor Manufacturing Inc. in Fremont, Calif., have been running some Saturdays to replenish inventories of Toyota Corollas. In September, Toyota said it will close NUMMI in 2010 because the factory is unprofitable. Toyota's partner in the factory, General Motors Co., abandoned the venture in the wake of GM's bankruptcy. Tanguay said that closing NUMMI will require the Cambridge plant to run still more overtime to meet demand for Corollas. But he said there is no plan to add capacity for the model. “There is more demand than capacity, but we're not going to add any capacity,” Tanguay said emphatically of the Ontario plant. U.S. sales of the Lexus RX also have defied the market turmoil, rising 10 percent through the first 11 months of this year. Tanguay said Toyota is still considering its plans for a new auto plant in Tupelo, Miss. A project to construct a $1.3 billion Prius factory there was halted in midstream late last year.